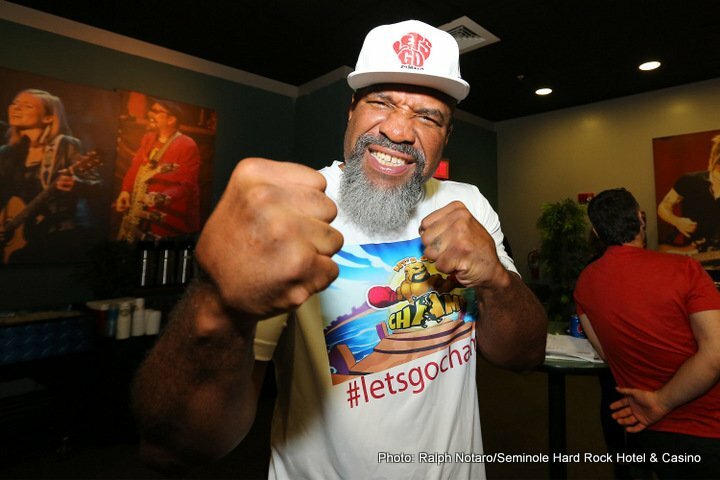 Always a fun guy to listen to, former two-time heavyweight boss (WBO and lineal) Shannon Briggs recently gave an interview from his home to IfLTV and the 46 year old gave his sage advice to Tyson Fury, telling the man he says he has a great deal of affection for how he is not yet ready to get in there with Deontay Wilder (“he cracks bones,” Briggs said of Wilder). Briggs also spoke a great deal of sense when predicting the upcoming Anthony Joshua-Alexander Povetkin fight(“he [Pov] jumps in real well, he fights on the break well and if he can get inside Joshua’s jab…..”) – calling it a 50/50 fight. Briggs, 60-6(53) also spoke about his own career, such as it is at present. Inactive since scoring a one-round win just over two years ago and sidelined by a failed drugs test (Briggs adding his name to the seemingly ever growing list of big names busted) “The Cannon” says he will fight again in November. No word was given on an opponent or a venue, but it seems Briggs will fight again before he’s done causing mayhem and, it must be said, adding a great deal of fun to the heavyweight landscape he was last relevant in well over a decade ago. Briggs, who has seemed to have kept himself in good physical condition (going by appearances anyway) could possibly feature in another big (ish) fight or two before he’s done having fun. And Briggs says that today, looking after himself and not working under a promoter, he is having fun and that this is his main priority. Briggs is not, he insisted, fighting for the dollars and the cents. His reason for fighting on and risking his health (remember that truly awful hammering he took at the hands of Vitali Kitschko in 2010?) may make no sense to many, but Briggs is his own man. And he is a truly likeable man. A fight and a win at The Hard Rock in Florida is not out of the question, nor is a Briggs win over a fringe contender. And that would suit Briggs fine he says, as he has no real interest in winning back, or even trying to win back, the world title. That is ‘been there, done that’ stuff to the New Yorker. Look for Briggs to continue enjoying himself for another year or two (Briggs joked – at least he should have been joking – how me will fight on until he’s 66 or older!) and to entertain us fans as he does so. Let’s wish “The Cannon” all the best. And a good aim.